Very early in our marriage, Andrew was working late one night so I made myself stuffed peppers for dinner. No big deal, right? At the time, he was disappointed he was to have missed out on something that sounded so scrumptious. It was completely adorable, actually. We've shared plenty of memorable meals in the six years that have followed, but I always have a little chuckle thinking about it so many years later. 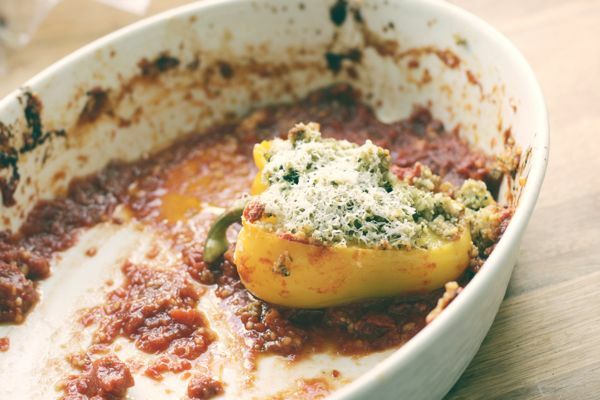 Of course, the memory surfaces whenever I consider adding stuffed peppers to our weekly menu, and I thought about it while making the pesto and sauteeing the zucchini this time around, too. This is a bright dish for fall, I think. The peppers are slightly sweet, tomato sauce brings an acidity to the plate and basil permeates through the couscous. You can't help but savor each bite. And this being the week of Thanksgiving, I've been reflective as I'm sure many of you have as well. This year I'm continually grateful for the life Andrew and I have built together and the opportunities we've had to experience the world in new ways. I hope you all enjoy some quality time with your friends and family this week, and take time to reflect on all the blessings in your life. To easily make this recipe vegan, simply omit the Parmesan cheese in the pesto. There is enough filling to stuff 4 peppers, but 3 fit perfectly into my baking dish so I saved the rest for lunch the next day. Preheat oven to 375. In a small saute pan, heat a little extra-virgin olive oil over medium heat. Add zucchini and cook until tender, about 5-7 minutes. Season with salt and pepper. While the zucchini cooks, bring 2 cups of water to a boil in a 4-quart stockpot. When boiling, add the couscous. Cover, remove from heat and let sit undisturbed for 5 minutes. Make the pesto by pulsing the basil, garlic and cheese in a food processor. Stream in enough oil to make the consistency smooth and loose enough to toss with the couscous. Now that everything is prepared, add the zucchini and pesto to the couscous and stir gently to combine. Season with salt. Pour the tomato sauce into a baking dish. Stuff each pepper generously with the couscous and arrange on top of the sauce. Cover with foil and bake for 35 minutes, or until the peppers are tender. Sprinkle some cheese on top (if using) and bake uncovered for an additional 15 minutes. Serve hot.